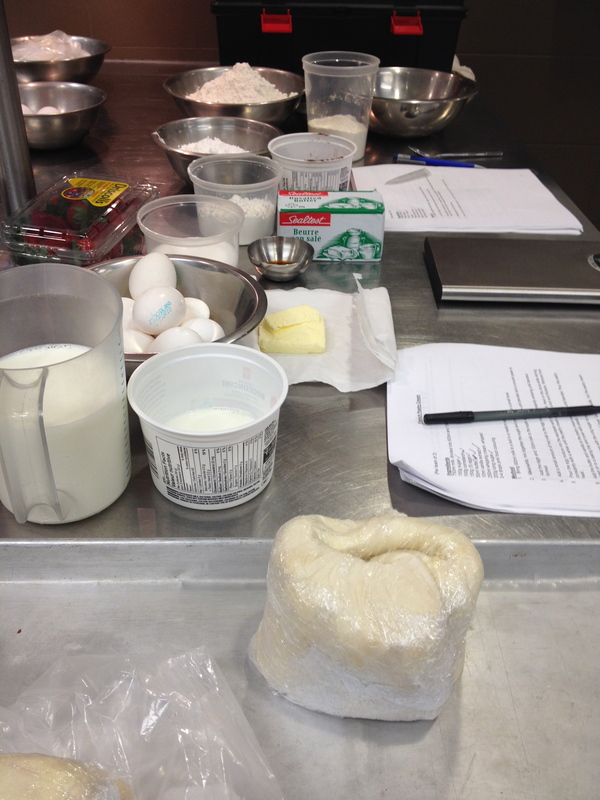 I’m finding it hard to get back into the swing of baking class these days. Not sure why but I hope I figure it out soon. 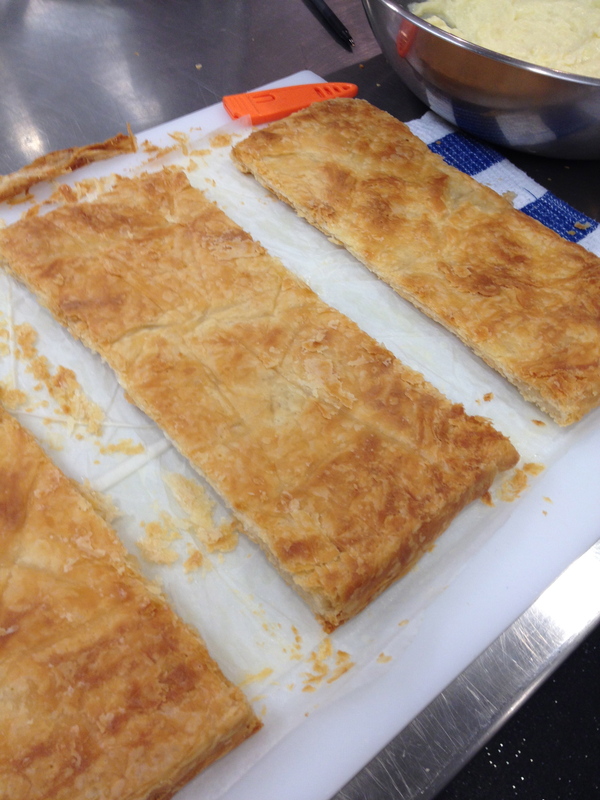 In this class, we were working with the last ball of puff pastry and making Napoleons aka mille feuille, a french pastry involving vanilla custard layered between sheets of puff pastry and sometimes involving fruit, cocoa, or nuts. 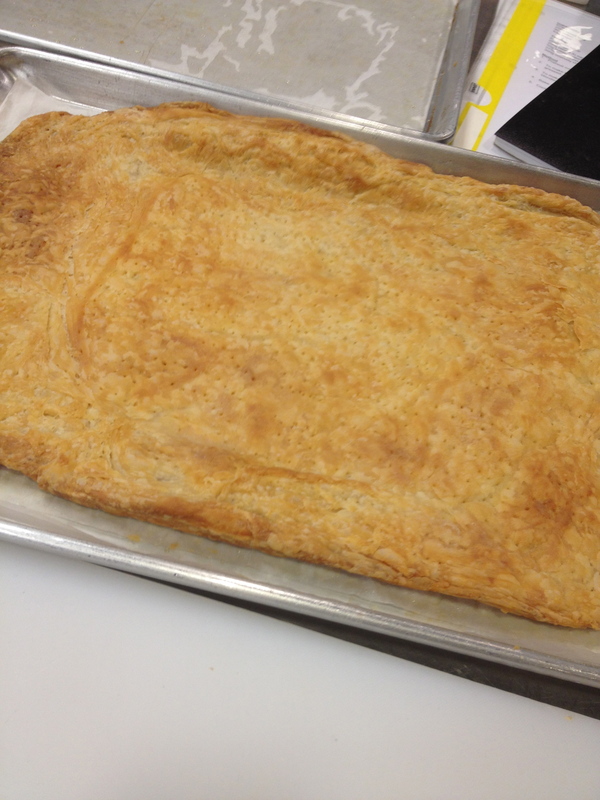 Rolled out the puff pastry ball and then baked until tan and crispy. 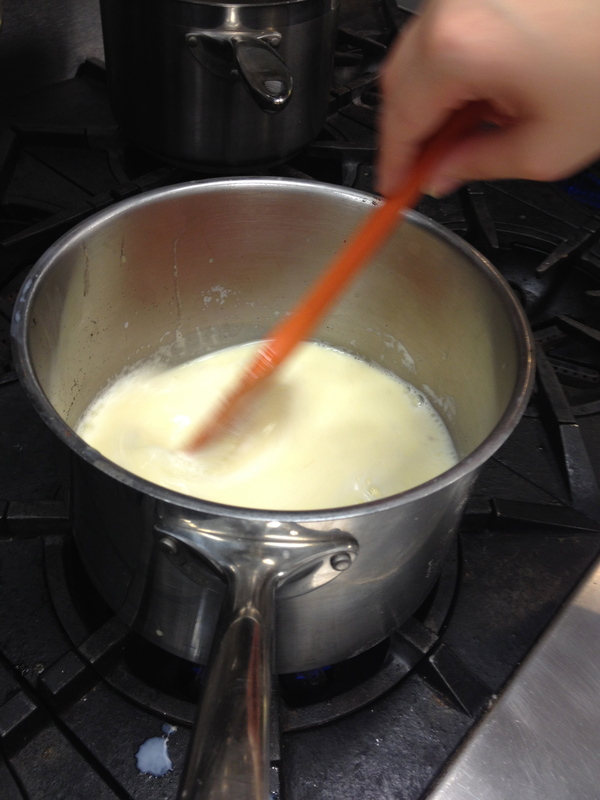 As the pastry cooled, it was time to make the vanilla custard. Milk, cornstarch, eggs, sugar, butter and a vanilla bean. Heated to a boil and allowed to thicken. 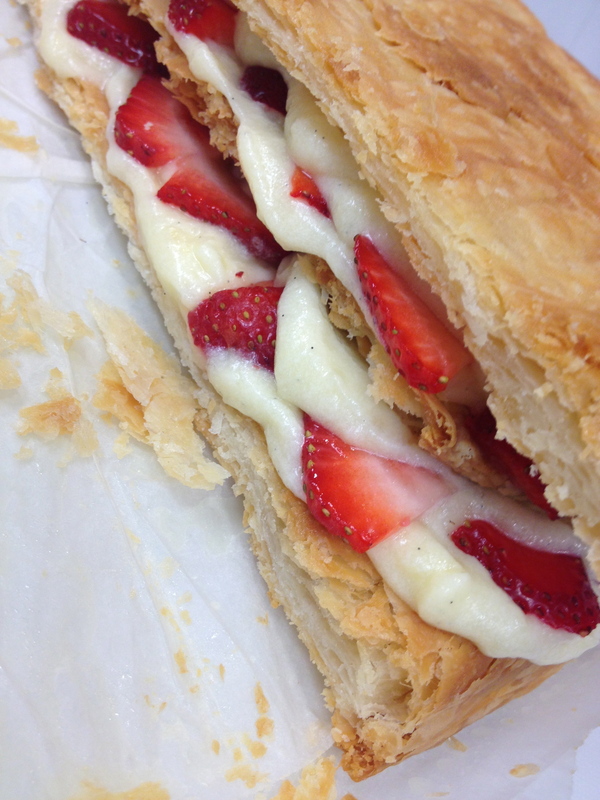 Whipped cream was eventually folded into the custard to thin it out slightly, but make it richer. Now time for assembly. 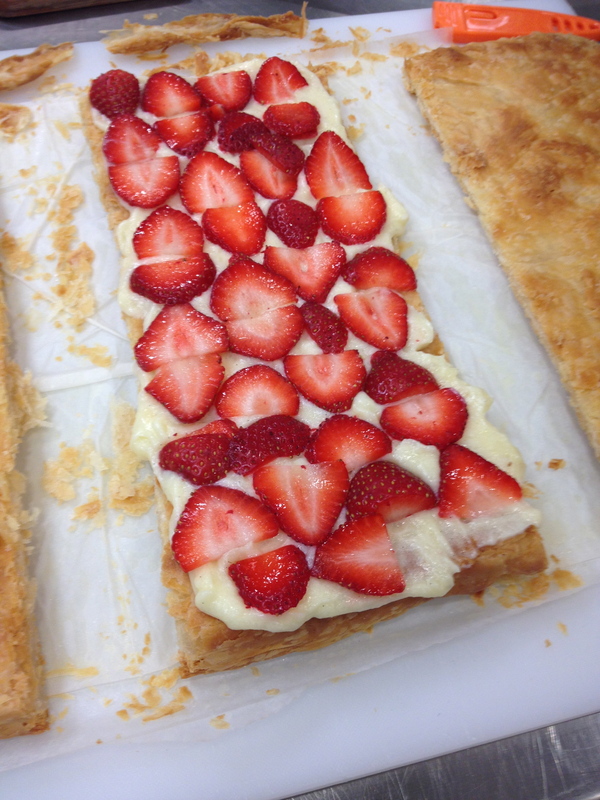 First the strawberries were sliced thinly and the puff pastry cut into 3 equal pieces. 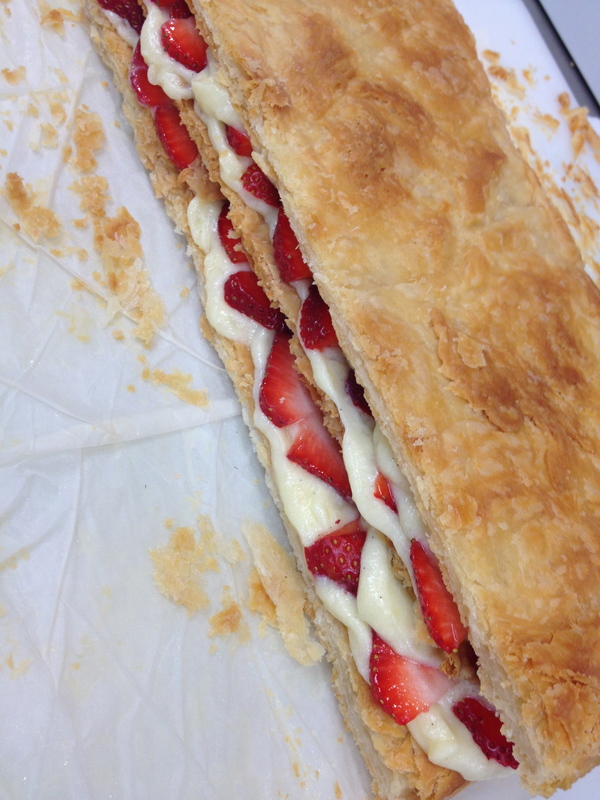 One sheet on the bottom and custard cream layered on then some berries. Repeat. In the end I ended up with this. It’s missing a layer of fondant on top. Time was off the essence this day, but I think we all get the gist. I am thankful for the people in my life that I can truly call friends. The ones that have always been there to happily share my highs and comfort me in my lows but are honest enough to tell me when I need to snap out of it and get over myself. The least I could do for one of my friends is to bake her a birthday cake. Not just any cake but her favourite – A Strawberry Shortcake. I followed a recipe taught to me in bake class but I had to split the formula because I only wanted to make one cake. The cake is simply made of eggs, sugar, bread flour, vanilla and salt to taste. 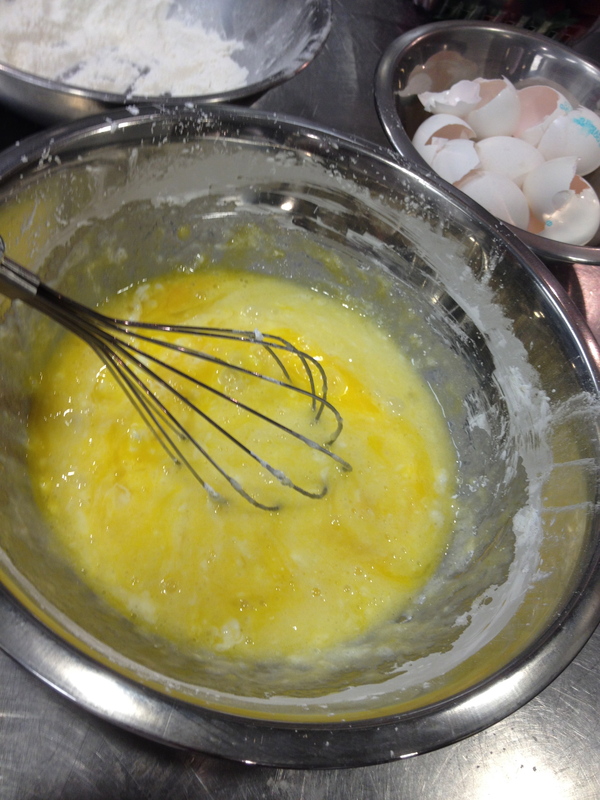 The eggs, sugar, vanilla and salt are whipped for about 12 – 15 minutes, just until the mixture rises, looks fluffy but is firm in consistency. 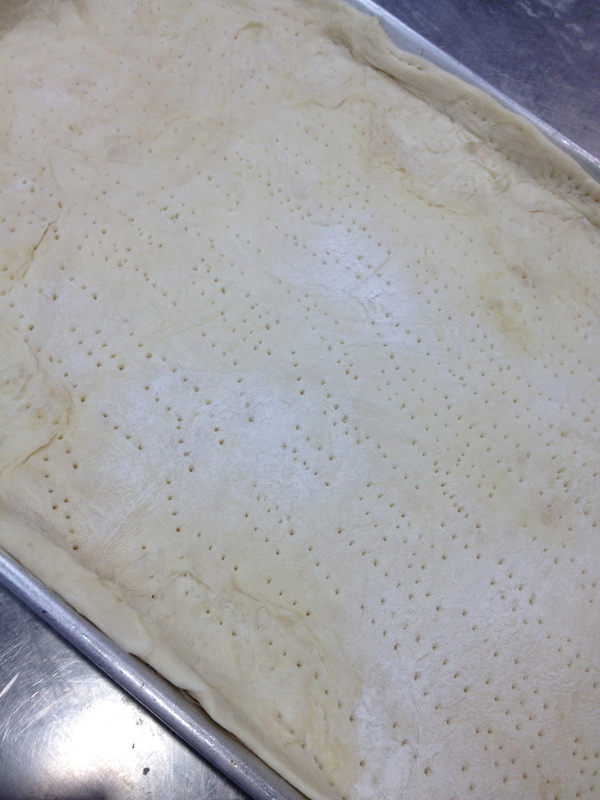 Once that is achieved, the flour is folded in by hand until well incorporated. I have one extra step I include, but it’s my little secret. 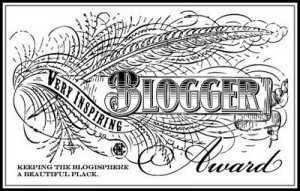 Perhaps if you are observant you will figure it out. Let me know if you think you know. 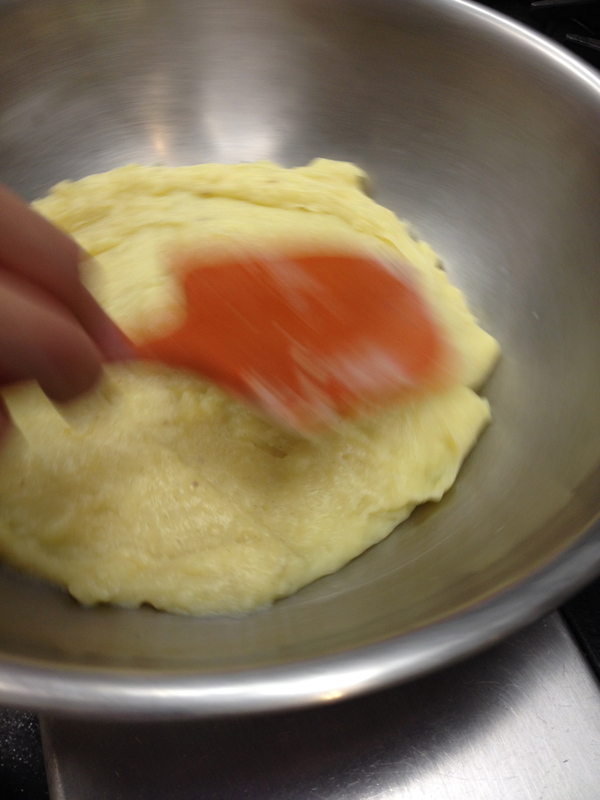 The batter is poured into greased round cake pans and into the oven they go. Now, I won’t lie, I had a little bit of a panic attack watching these bake. At the end of the suggested 20 minute bake time at 200 degrees, the cake was nowhere near done. I waited another 10 minutes and still the same. I began to worry that I had ruined the formula and measured incorrectly. I decided to turn up the heat to 300 degrees. Success, baked cakes after 20 more minutes. 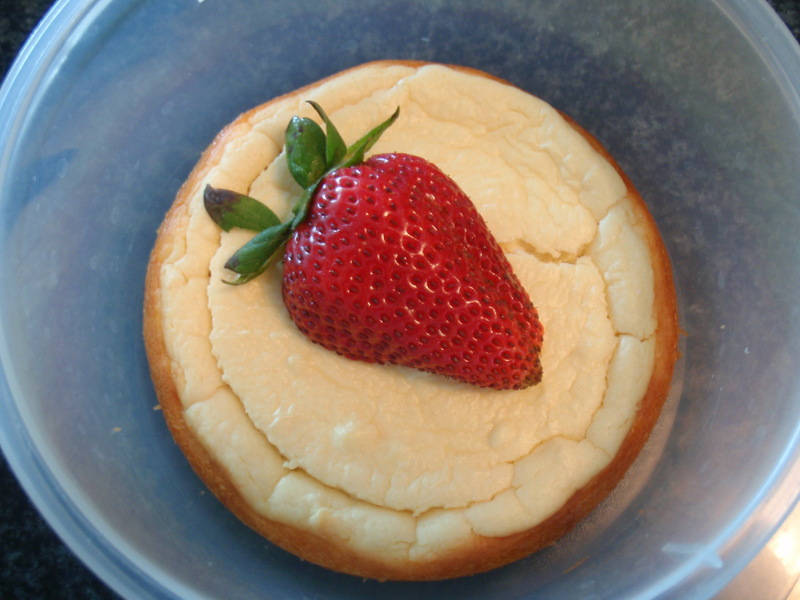 I remember when I used to think making a cheesecake was so difficult. Then I made one and now it has become a staple in my baking repertoire. It’s the only dessert I can make without looking at a recipe. This one is flavoured with vanilla and lemon. For a crust I used crushed up Arrowroot cookies because I had them on hand. 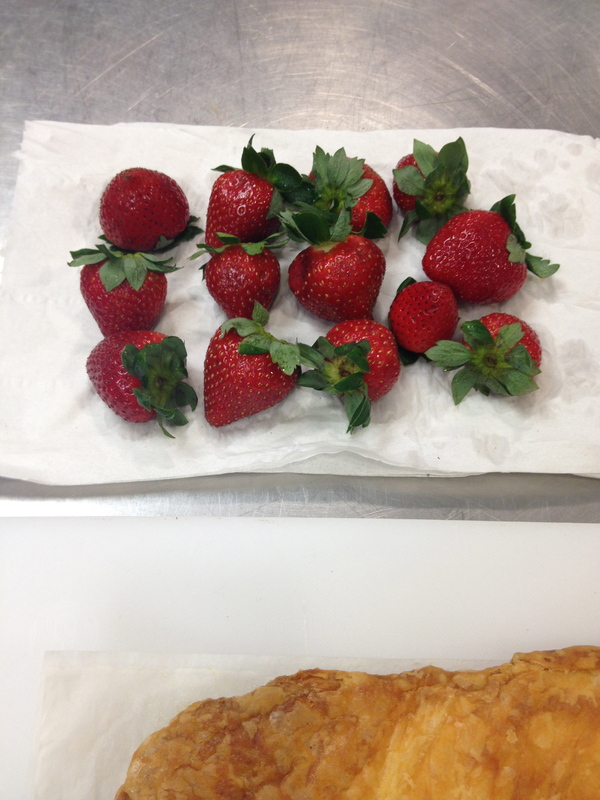 Then I garnished with strawberries. Then I made this next cheesecake for an old and dear friend and his wife who are celebrating the birth of their first child only a few days ago. 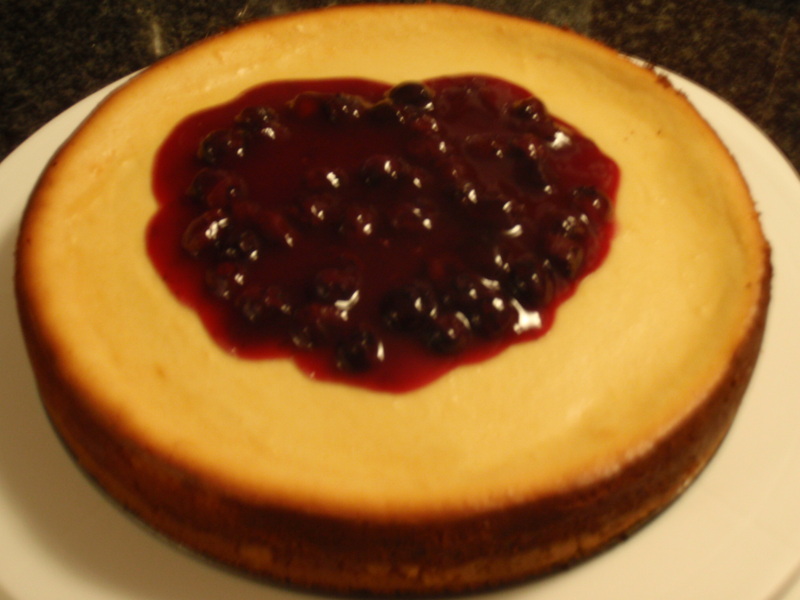 Here’s a “Welcome to the World” lemon flavoured cheesecake with homemade blueberry sauce on top.